I am delighted to open today’s joint event with the Millennium Challenge Corporation (MCC): a leader in the fight against global poverty. 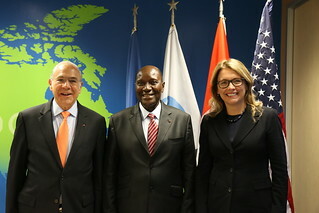 At last month’s US Africa Business Forum in New York, the OECD and MCC announced a new partnership that will leverage the synergies between the OECD’s Multidimensional Country Reviews (MDCRs) and MCC’s Constraints Analysis to support inclusive and sustainable growth in emerging and developing countries. Today’s event ─ which focuses on our respective efforts to catalyse private investment in Côte d’Ivoire ─ marks the beginning of our collaboration. The OECD’s MDCRs diagnose context-specific barriers to growth and development. By focusing on cross cutting issues, MDCRs consider the complementarities and trade-offs of different policy responses. They aim to reconcile economic, social and environmental objectives to help shape nationally-owned and implemented development strategies. MDCRs are an important tool in the OECD’s efforts to support the 2030 Agenda for Sustainable Development and the SDGs. To date, the OECD has completed MDCRs with Myanmar, Peru, Kazakhstan and Uruguay. In 2015, Côte d’Ivoire became the first African country to complete an MDCR ─ and in record time! Let me briefly share with you some of the key findings of our analysis. Côte d’Ivoire is one of the most dynamic economies in West Africa with real GDP growth averaging 9% annually since 2012. This success has catalysed several positive developments: private investment increased from 17.2% of GDP in 2012 to 18.6% in 2016; FDI has more than doubled in recent years, reaching 680 million US dollars in 2015; and infrastructure and basic social service delivery are gradually improving. Nonetheless, overall well-being has not greatly improved and inequalities persist: per capita incomes have risen only marginally, and improvements in living standards are constrained by poor education, limited access to affordable and high-quality healthcare, outdated housing, and low civic participation. investing in quality education and appropriate skills by building physical school infrastructure, improving training for teachers, encouraging student attendance (for example through free school lunch programmes), raising the profile of technical and vocational education, and strengthening adult literacy programmes to ensure the workforce is equipped with the right knowledge and skills. This is a very ambitious medium-term agenda for action. The OECD is working closely with the Ivoirian authorities to monitor the implementation of relevant reforms. We are also looking at how we can accelerate Côte d’Ivoire’s development by collaborating with other stakeholders. This brings me to the OECD’s new partnership with MCC. This partnership ─ which will build on a very fruitful experience of mutual learning between our teams and will be strengthened through an MOU ─ will bring together insights and continued policy support from our MDCRs and MCC’s Constraints Analysis to explore how we can better engage the private sector, unlock private investment and enhance wellbeing in emerging and frontier markets. Côte d’Ivoire will be the first country to benefit from this partnership. Today, our discussions will focus on how best to promote investment opportunities in Côte d’Ivoire, and we look forward to hearing your perspectives and insights. Future seminars will focus on different country contexts to support mutual learning and knowledge exchange. Our next discussion will take place next Spring in Paris, most likely on Senegal. Ladies and Gentlemen: This is only the beginning. We have so much work ahead of us. To achieve the ambitious development objectives set by developing and emerging countries and the international community ─ reflected in national development plans and the 2030 Agenda for Sustainable Development ─ we must all work together. Effective partnerships like this one will be key to our success. An African proverb says that ‘‘if you want to go fast, go alone. But, if you want to go far, go together’’. Working together, we can design, develop and deliver better policies for better lives in developing and emerging countries.